Guilt-free napping for better working conditions. Match the descriptive adjectives (1-4) to something that this person would say (a-d). 1. How do you feel today? 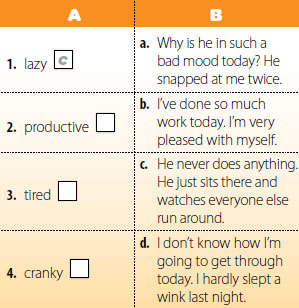 Which adjective from Exercise 1 best describes your mood? 2. Do you have any lazy colleagues? Who? 3. Do you get cranky at work? Why? When? The latest issue of Hot English (168 – the May issue) is out now! Learn over 300 useful words and expressions and improve your listening skills with Learn Hot English! 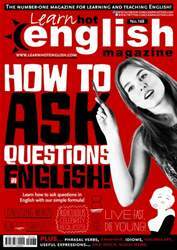 This month: Find out how to ask questions in English. Plus, 15 useful expressions to use at the swimming pool, 10 useful words and expressions for talking about musical instruments, 7 ways to make a suggestion, 8 useful expressions phrasal verbs, 8 idioms, 8 useful phrases for talking about stopping... plus: • Language – confusing words. • Speaking – common errors. • Games – crossword and wordsearch. • Humour – funny funerals. • Sport – the Olympics. • Film – stars who died young. • Phone – booking a room. • Work – sleeping at work. • Slang – our dictionary of slang. • Nature – the platypus. • Urban – Parkour. • The office – jobsworths. AND LOTS, LOTS MORE! By reading and listening to all this great content, you'll improve your English reading and listening skills and learn up to 300 useful words or expressions. Plus, you'll get a better job and pass English-language exams more easily. Guaranteed! HOW TO ASK QUESTiONS iN ENGLiSH! The Dark Knight… Why so Serious?